How can a cloud evaporate into a cloud? So you wake up, and you have no idea what the day has waiting for you. The pace is recognisable; the landscape is a familiar Sunday. Then you go for a run and instead of the pain and exhaustion that you have been trying to run through for weeks, your veins suddenly run champagne. It has been a bad month or two. My asthma got so bad that I leant on some steroids for about a week. They made my head feel wrong. I lost sleep because I would ping awake at three or four in the morning, so would get up and get ahead with my work and emails. By four in the afternoon I would be exhausted, but my asthma was perfect. After a few days I felt ready to run again, but I only managed a couple before I was taken down with a cough that everyone seemed to get. Another ten days or so. I finally felt ready to run, did a couple. Then, after spending a morning hunched in bed, writing, my back gave out, so I couldn’t run for another two weeks or so. I gave myself the all-clear about a week ago, so set out. I couldn’t believe what had happened. In September I did and 18.2 mile long run and was managing a 40 mile week. I hit a few speed-bumps, and all that was left of that fitness was, 4 hard and icy miles. My legs were sore; I was tired; my ankle swelled a bit; my illiotibial band hurt. ‘First run jitters’, I thought? The next day I only managed three miles and I was utterly spent. I had the following day off to recover. I went back the following day and I managed all of two miles. This was a major setback. How could my calves hurt so much after all the mileage I had put into them? I had just got to halfway with my marathon sponsorship and it felt like all my hard-won fitness had the longevity and sustainability of a Greek Euro. I didn’t stop. I have been two days on, one day off ever since. Doing what I can manage. They have been hard, unfulfilling, runs. None of them reminded me in the least of why I was doing any of this. I don’t quite know where the day went, but it was suddenly the middle of the afternoon and I was supposed to have headed out in the morning. I quickly change as some of the light is already going, and I am angry with myself for having, yet again, to run in the dark when I had wasted the day sat at my computer. I step out, and my legs, for the first time in a couple of weeks, don’t feel tired. I follow my familiar route. The sun is setting. I will be finishing this run in the dark. Again. The air’s heavy and dank. Not too cold. Everywhere droplets glisten, but this water fell from a cloud and hasn’t moved since it got here, days ago. The atmosphere is too heavy for it to evaporate into. How can a cloud evaporate into a cloud? It is not until I turn onto Blackheath that I see the thick banks of fog that gather, just like cumulus clouds, directly above the point where moisture is trying to escape. Where there’s grass, there’s fog. The sun is setting, too, leaving bright pink candy stripes across the sky that shimmers through the mist. I laugh because the thing that it looks most like is candyfloss. Summer has leap-frogged autumn and met winter. Wordsworth loved mist precisely because of the manner in which it prevented him from seeing. The ‘Mont Blanc’ sequence in The Preludeis when he is at his most eloquently disappointed by ‘the desert of the real’. For days he climbs The Alps, his anticipation swelling with every crunching step towards the summit. The clouds part. The summit of Mont Blanc is lain before him in bright sunlight. And, he ‘grieved to have a soulless image on the eye.’ The hierarchy of perception dictates Wordsworth’s relationship with the place. He expects an aesthetic experience, but he gets a natural one. He prefers the mist. It is intellectually fructifying. The boundlessness of his imagination is free to envision this moment of communion in numerous ways, but Wordsworth’s ‘real’ experience reduces it to one. Mont Blanc is revealed. It is bald, plain. Only on the descent do the limits of his imagination begin to shimmer once again as they fail to recall the reality of his memory. As his descent continues, he is able to take ownership of the place by forgetting its actuality. 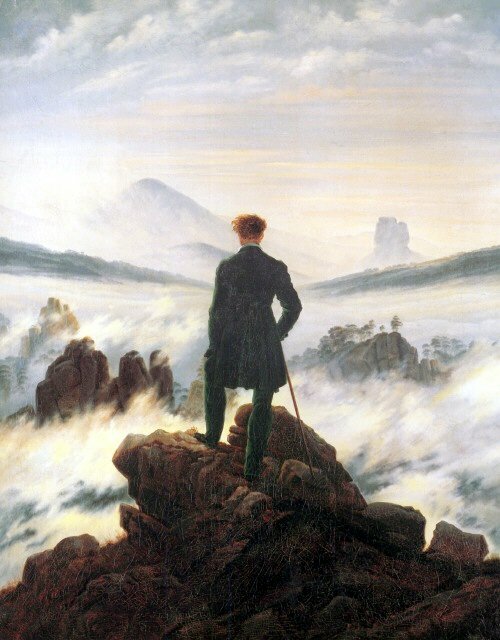 In an inversion of Friedrich’s The Wanderer above the Sea and Fog, Wordsworth descends below the clouds so that he can become the self-proclaimed conqueror of his land once again. There is something unpleasantly coercive in Wordsworth’s relationship with nature. He seems to want to not want it. His idea of it is more important. Nature cannot exist on its own terms, and here it seems to become a psychological construction. A theatre in which Man may celebrate his divine powers of creativity. A proscenuim to frame his own ideology. I love fog. Obviously not because the air is even more difficult to breathe than normal. And not because it keeps a ‘soulless image’ from my eyes. Or is it? I think I love it because it randomnly selects and deselects aspects of the landscape that we would never think to rest our eye upon. Unlike snow, it does not come to rest in predictable places. In seconds, it can change everything. I should be sensible and keep my run short. But I can’t not divert into Greenwich Park with the heath looking so magical. Erasure and focus. Telescope and microscope. Grayscale and technicolour. Fog alters the way that we can look at a place. But if you close your eyes, it sounds different, too. The acoustics are not so eidered as they are by a quilt of snow. It’s more like a century or two of forest has sprung up around you. Open spaces are suddenly private and enclosed ones. Pathways in your vision suddenly close and your eyes must find a new route. Like the landscape has become braille, you have to feel your way through it. When I first enter the park it is a disappointment; this is not why I am going overdrawn in my energy bank. Too much of it is hidden from view. The path goes off in three directions, but they are so stunted that they look more like the tines of a fork than long and winding waythrus. Just like on the Heath, the fog has landed on the ground like dollops of mashed potato and in seconds I’m through and the landscape is renewed. Canary Wharf, a clutch of buildings I usually dislike because of their sturdy dominance of the London skyline (like two tectonic plates of Meccano collided a few millennia ago), looks fantastical. The fog rests so heavily that the ground and the river that separates us has disappeared altogether leaving the buildings to float above this sea of clouds. The sky is still pink from a setting sun. The interior lights of One Canada Square usually look steely-white against a night sky, but the grey of the fog does something altogether different to them. Grey, even as a metaphor, is supposed to signify absence. Without colour, without character, it is ‘grey’. But the grey of the fog seems to lend itself to its surroundings. For this dusk, the lights of One Canada Square sparkle with a deeply affluent gold. The building next to it is trimmed with neon tubes of shimmering teal. These are the same lights that have always been there, so the grey of the fog cannot be ‘no colour’, but one that gives itself to others. Grey is only grey because it has given itself away. It has made this magnificent cloud city. I turn my back on this sight and head for home, into the mist. And as I run into another cloud on the land, for the first time in months, I feel not like I could go on forever, but at last, that I might want to. Not only does fog alter the way we look at a place but running, and thinking about running, alters the way we can think about grey. Such a beautiful piece of writing.